Last night Stuart and I went to see The Winter's Tale at the Garrick Theatre in London's glitzy West End. 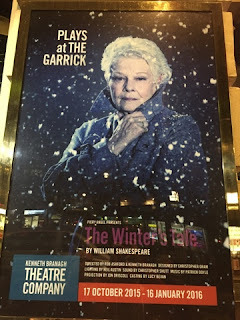 Starring Judi Dench as Paulina, Kenneth Branaugh as Leontes, Hadley Fraser as Polixenes, Jessie Buckley as Perdita and Miranda Raison as Hermione is was certainly an all-star cast. But did they live up to our expectations? Did they manage to crack one of Shakespeare's 'difficult' plays? You betcha! In the first half we meet Leontes and Polixenes who are both kings and best friends. Leontes gets it into his head that his wife Hermione is having an affair with Polixenes. So rather like Othello, here it is male sexual jealousy that leads to the psychological drama. All havoc breaks loose with threats, banishment and terrible tragedy culminating with the famous stage direction "Exit pursued by a bear." Happiness ahoy though as in the second half set sixteen years later we are treated to some light-hearten comic revelry with shepherds and tinkers. The players from the first half have mellowed and are seeking reconciliation. Their offspring have grown up and fallen in love. Some assume a disguise, those that were assumed lost are found and everyone assumes their happy match in the end. Kenneth Branaugh is a master in charge of his material from the staging to the acting to the soundscape to the lighting to the costumes. It all came together perfectly.